Chinese smartphone manufacturer Xiaomi have released their first smartphone running stock Android Get the Stock Android Experience on Any Phone Without Root Get the Stock Android Experience on Any Phone Without Root A lot of Android devices have very customized interfaces, but you can get a stock Android look without even rooting your device! Read More — and it looks quite impressive! The Mi A1 was launched at a press conference in India (a massive market for Xiaomi), and it will be the first device from the Chinese firm to run the Android One software out-of-the-box. Android One isn’t really talked about all that much. The idea was to bring Android functionality to new markets across emerging nations. The new Mi A1 comes will retail for around $230 — significantly more than the $50 handsets The 5 Best Cheap Android Phones in 2017 The 5 Best Cheap Android Phones in 2017 Looking for an inexpensive Android phone? You've come to the right place. Read More previously associated with the Android One scheme. Better yet, the handset will receive an Android Oreo update when the new Android operating system arrives before the end of 2017. The Mi A1 offers a relatively-sleek, 5.5″ full-metal body, complete with a full HD display. It is 7.5mm thick — slimmer than the Samsung Galaxy S8 The Greatest Smartphone You Shouldn't Buy: Samsung Galaxy S8 Review (and Giveaway!) The Greatest Smartphone You Shouldn't Buy: Samsung Galaxy S8 Review (and Giveaway!) The $800 Samsung Galaxy S8 is, without question, the best smartphone ever made. But you probably shouldn't buy one. 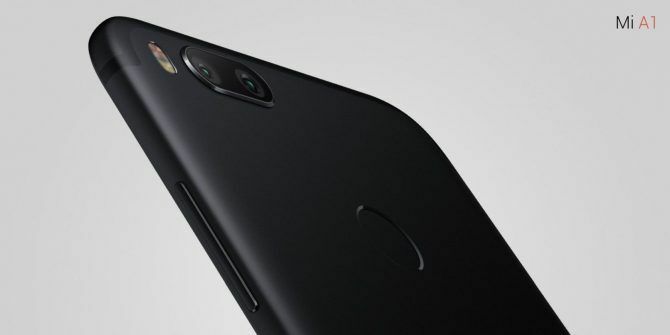 Read More — and packs a dual-camera setup very similar to other high-end Xiaomi devices. The back camera is a 12MP telephoto lens, combined with a wide-angle lens, while the front-facing camera comes in at 5MP. It even has a fingerprint scanner on the back! Under the hood, there is a very respectable Qualcomm Snapdragon 625, along with 4GB RAM, and 64GB storage (expandable to 128GB). The battery is rated 3080 mAh Which Smartphones Have the Best Battery Life in 2016? Which Smartphones Have the Best Battery Life in 2016? Mobile phone users today demand battery life over all other concerns. Short battery life is the only real limitation of the modern smartphone. So which smartphones offer the best battery life? Read More , and charges over USB-C.
Really, the Mi A1 doesn’t even compare to other devices in the Android One range. It simply wipes the floor with them — and then some. The announcement of Android Go, a special implementation of Android Oreo, means we are likely to see more and more phones hitting the market before the end of the year. Back to the device at hand. The Mi A1 is essentially an international version of the flagship Xiaomi Mi 5X that launcher earlier this year in China. The partnership between Xiaomi and Google confirms that the Android One program isn’t dead — it was just resting. For the price, this is a really excellent smartphone. It is currently available in over 40 countries, but you’ll have to try hard to track one down! Do you like the Xiaomi devices? Is the novelty of a Xiaomi device running stock Android worth the outlay? Or are the specs alone a good investment? Let us know your thoughts below! Explore more about: Android O, Android One, Hardware Tips. Finally a Xiaomi phone with stock android!! YES! !